One month after opening its doors for the first time in Quebec, the new P.F. Chang’s China Bistro is bringing in the crowds at its gorgeous Montreal location on Rue des Jockeys next to the former Blue Bonnets Raceway and off of the Decarie Expressway. Aronovici (right) and director of operations Cary Mausner. I was there for a daytime visit on the eve of its formal opening to meet the founder of the international chain, Philip Chiang. But other commitments prevented me from attending a couple of VIP celebrations. My family and I finally got to try it out on May 17 and it was everything we expected it to be and more. We have always been huge fans of P.F. Chang’s, dining there every chance we came close to one while travelling in the States. In January we ate at the first Canadian location in Toronto. It was cold mid-week evening and the place was packed. Well, Michael Aronovici, the man who has brought P.F. Chang’s to Canada, really thought this over very well. You know what they say about “location, location, location.” In Toronto, a trendy shopping plaza in Don Mills was chosen. Rue des Jockeys here is centrally located and it has already attracted a loyal following of regulars. On June 17, Aronovici’s Interaction Asian Restaurants will debut the next P.F. Chang’s at Carrefour Laval. We arrived at 7:30 p.m. Outside, the valet parking attendants were busy while inside sat dozens of people with pagers, patiently waiting for tables. I saw many familiar faces. One of them was Aronovici, who was there with his own family. Manager Emile Haykel was supervising the busy kitchen, the bar and the two levels of seating. Our waiter was Eric, an enthusiastic young man who treated us to the chain’s traditional creation of a special dipping sauce, done right before your very eyes. Each server has their own mixtures. Each dish on the P.F. 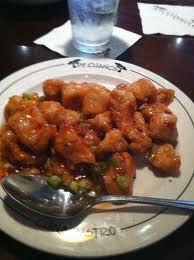 Chang’s menu is prepared to order using the freshest and highest quality ingredients. The environment at each location combines influences of Chinese and American cultures. A panoramic, hand-painted mural depicting 12th century China, is visible from the main dining room and commands attention as the restaurant’s centerpiece, while several terra-cotta warriors stand guard. The majestic 11 foot tall horses grace the entrance to many of the restaurants, including Montreal. This horse symbolizes the original Forbidden City in China, which was built for China’s first emperor Qin Shi Huangdi. I started off with some won ton soup, containing pork wontons, mushrooms, fresh spinach, water chestnuts, chicken and shrimp in a savory chicken broth. Then it was time for P.F. 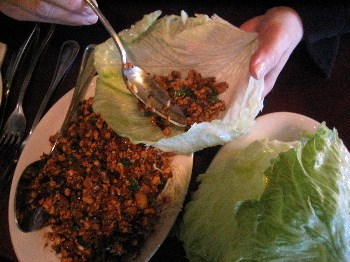 Chang’s signature chicken lettuce wraps: wok seared minced chicken, mushrooms, green onions and water chestnuts served over crispy rice sticks with cool, crisp lettuce cups. This is a place where sharing dishes makes the most sense. My recommendation is the Mongolian beef (tender flank steak wok-cooked then quickly tossed with scallions and garlic), crispy honey shrimp (lightly battered and tossed in a sweet and tangy honey sauce with green onions), crispy honey chicken (lightly battered and served in a sweet sauce over a bed of crispy rice sticks), double pan-fried noodles (crisp egg noodles stir-fried with mushrooms, bok choy, carrots, celery and onions and comes with a choice of beef, pork, chicken, shrimp or vegetable) and a bowl of steamed rice. When we got ready to leave, towards 9:45p.m., large groups of people were still filing in. P.F. Chang’s does take reservations, but leaves about 25 percent of the availability for walk-ins. This new Montreal locale can seat 280 people, plus 50 on the unique terrace which even has heaters for when the weather turns a bit nippy. There is a staff of 170. You can log on to www.pfchangs.ca to see the menu. Takeout is available. You can call 514-731-2020 for reservations. The restaurant is also opened for lunch, with some great deals. Here is the interview I did with Aronovici and Philip Chiang last month. Your Informative article is very helping for those who visit your this blog to know about montreal. Thank you very much for share this blog.